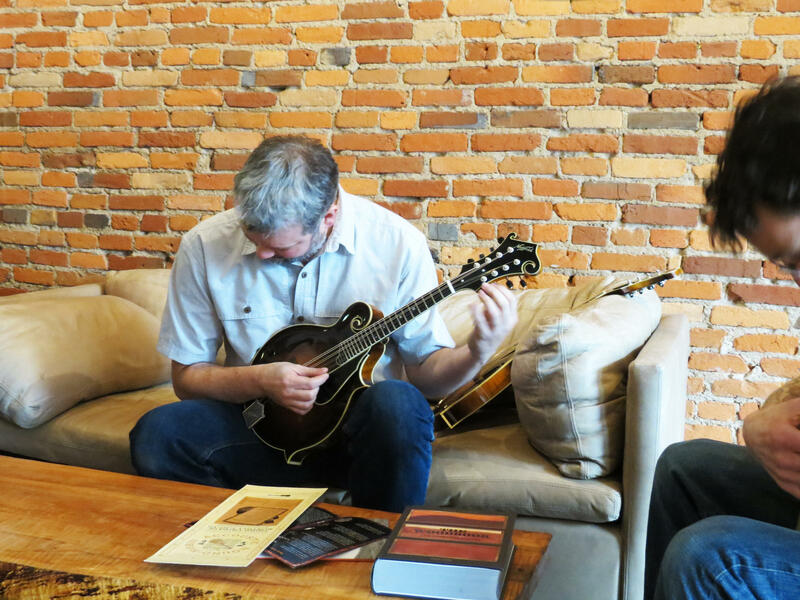 Adrian Bagale and Derek Smith of Northfield Mandolins play some bluegrass in the company's offices in Marshall, Mich.
With only 10 years in the business of stringed instruments, Marshall's Northfield Mandolins is relatively new to the new game. But by taking an approach of working internationally, and literally working around the clock -- 24 hours a day -- Northfield is already making a name for itself around the globe. All from a small workshop in a small, Southwest Michigan town. If you walk through downtown Marshall, it’s easy to miss Northfield's small office. But once you find the Northfield logo on a small door and walk inside, you’ll find yourself in bluegrass heaven. 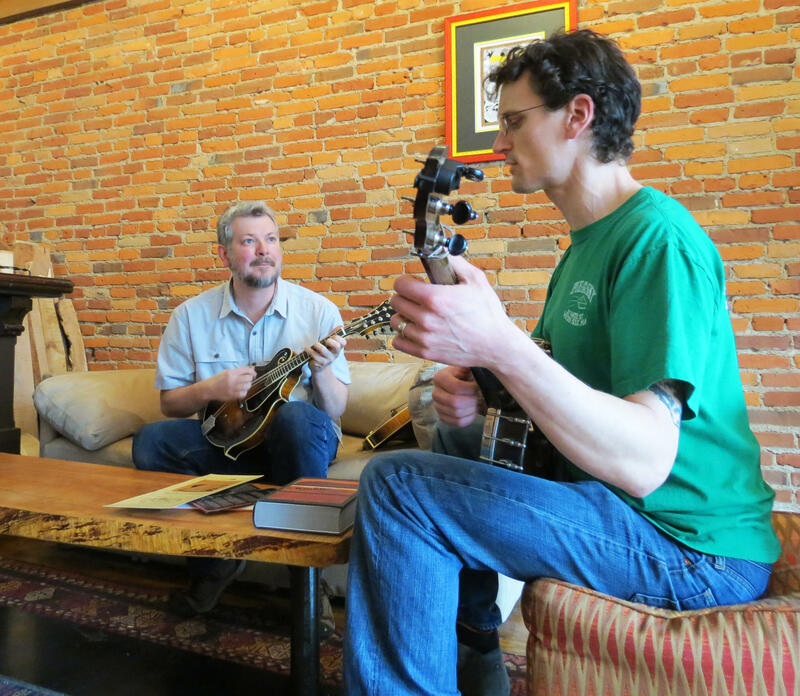 Inside, Northfield co-founder Adrian Bagale strums a traditional bluegrass tune on a brand new mandolin, fashioned like the ones Gibson made back in the 1920s. In the back, workers sand and lather unfinished mandolins that’ll eventually fetch up to $6,000 a piece. Bagale says Northfield is known across the bluegrass world, but in Marshall? Not so much. A lot of that ignorance is because while Northfield may be based in Marshall, it is not a local business. If anything, it’s global. Half of the Northfield team is based thousands of miles away, in a workshop in Qingdao, China. The team includes workshop founder Kosuke Kyomori and team leader Xi Sheng Zhang. The other half is here. Between the two shops, there is someone working on a Northfield Mandolin nearly 24 hours a day. "They don’t really understand this is a tiny thing, but it has an international footprint," Bagale says. "So this really is an international company sitting in the middle of this tiny town." So how did this international company wind up here? It all starts with Bagale. He started working with guitars in Michigan, but moved to the West Coast and eventually China. There, he worked for a guitar company designing high-quality mandolins. But eventually, the work for him and his small team of woodworkers and engineers got to be too much. Bagale resigned. But seeing the quality of work they were making, Bagale's team didn't want it to end. "I mean, we just spent three years trying to make this happen," Bagale recalls his team telling him. "So we need to do it for ourselves. And we know how to do it, and we want to do it! And we know if we stuck together, we’d make something great." So they formed Northfield Mandolins, with the goal of making the best mandolins they could, influenced by the Gibson brands of the 1920s. Family brought Bagale back to Marshall, but the company stayed together, now spread across the globe. Bagale says by the time Northfield had produced its first 30 mandolins, it had a beautiful product on its hands. But sometimes, you still need a little luck to get your product sold. For Northfield, that came at a conference in Nashville back in 2009. 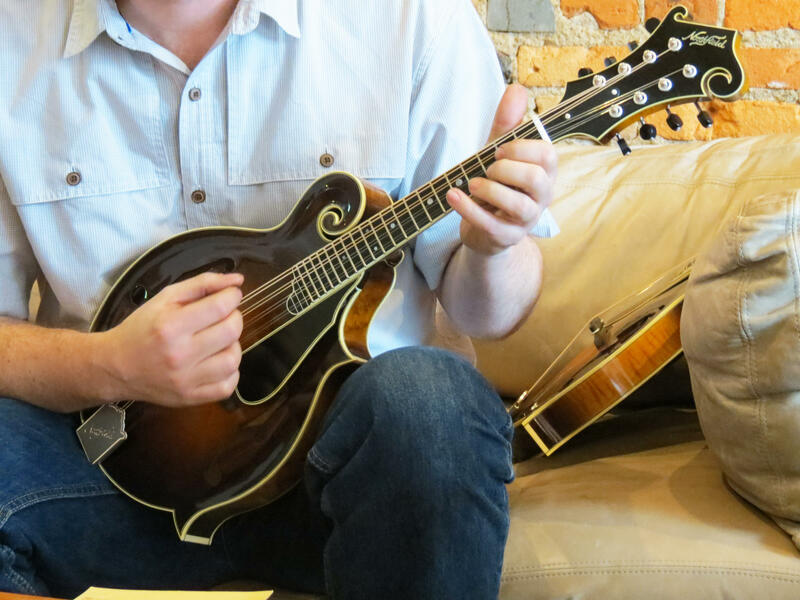 The company brought eight mandolins there – the first eight it had ever put up for sale. It sold seven. The last one was offered as a giveaway. "And it was our simple way for promotion, "Bagale says."Marketing. Everyone could come and check us out, win this great mandolin." But that giveaway changed the future of the company. The man who won the instrument? He was a student of Adam Steffey. That’s 5-time Grammy award-winning mandolin player Adam Steffey. So this student showed Steffey the mandolin. Steffey played a few songs. And almost immediately, Begale says, Steffey called Northfield to get one for himself. Suddenly, this tiny company, based in China and Marshall, was hitting the big time. "[Steffey] emailed me first," Bagale recalls. "And I read the email. And I immediately copied and pasted his email into Google to make sure it was that Adam Steffey. And he wanted a mandolin! And two weeks later, I was flying down to Nashville with two mandolins, the next batch. And that day, he got number 37." "From that point on, it’s been like holding on to a rocket ship," Bagale continues. "[Steffey] was so influential. We immediately sold out for the whole year. And the next year. And the next year." In just the past half-decade, Northfield has already seen huge expansion. The company went from selling 40 mandolins in 2010 to selling 150 last year. This year, the goal is 200 -- to dealers around the world. Back inside the company’s shop, Northfield woodworker Derek Smith picks away on the band’s newest mandolin, only a few weeks old. And he's excited about it. "This is, like, the best thing we’ve ever made by far!" Smith says, strumming and listening carefully to the punchy sound. "We’ve made a lot of good mandolins, but this is just better. Tonally, I mean we’re talking small, subtle things here, but there’s a tonal and a projection and a liveliness and a power coming out of this thing!" This is the kind of moment that the workers at Northfield strive for. And they say it's the result of the company constantly taking risks. With every single instrument, Smith says, the company documents everything -- new materials, new wood, new processes and steps. Bagale says this experimentation can lead to a few duds. But most of the time, it leads to something like this -- a unique, powerful instrument. He says the company will likely only be making more, especially as bluegrass keeps growing around the globe. "For it to be cool and hip right now, we feel like we’re in the right place and right time to be able to put our foot to the gas and do it and produce," Bagale says. "And we don’t have to make a ton to make this really fun, challenging and hopefully potentially profitable." Then Bagale pauses, turns to another employee, and shakes his head. "But who cares about money?" he laughs. "We wouldn’t be making mandolins if that was on our mind." 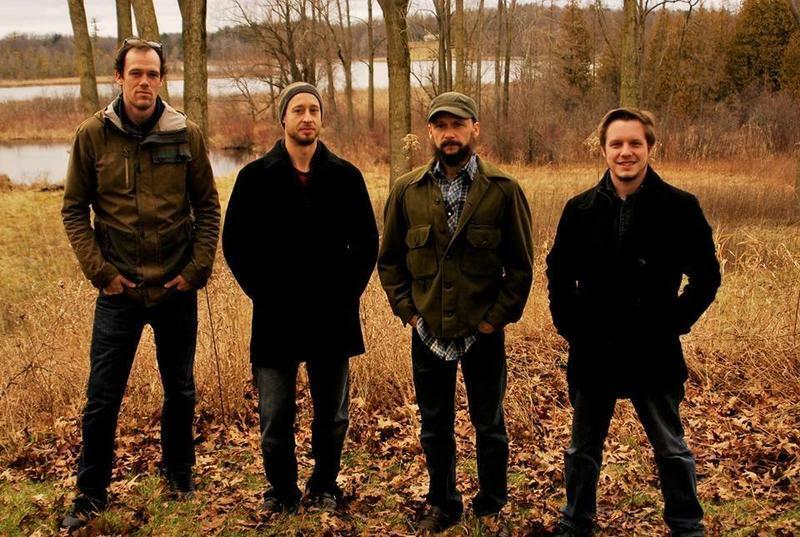 In January, the Michigan band Fauxgrass won the Fretboard Festival’s Play-In Contest for acoustic music. That secured them a spot in Saturday's Fretboard Festival lineup, alongside bands like The Red Sea Pedestrians, The Corn Fed Girls, and artists like Megan Dooley. Hear Fauxgrass on Arts & More. Scroll down to hear the interview with Jason Wheeler. The American Museum of Magic in downtown Marshall looks like any other storefront. But inside there’s a collection more eclectic and more thorough than anything you’ll see in the country. The brewery plans to hold a "red carpet" event for the show's premiere on July 29th.